at the Olympic Games in Seoul, Korea, 1988. Phyllis was born July 27, 1957, and grew up in Great Falls, VA. From the time she can remember, all she wanted to do was ride and train horses. She found her first pony under the Christmas tree in the living room when she was four years old, and hasn't looked back since. Phyllis was active in 4-H Club and showed Hunters as a kid, and was also an avid foxhunter from the time she was 12. She joined the Reston Pony Club (now Difficult Run), and eventually achieved her 'A' rating in Pony Club. After graduating from Herndon (VA) High School, she completed the Advanced Horsemasters course at Potomac Horse Center in Gaithersburg, MD, and then trained as a working student with top event rider Bruce Davidson in 1976. She continued to train with Bruce whenever she had the chance for over 20 years. Phyllis began Eventing in 1973, and reached the Advanced level in 1977 with Freedom Flight, a horse she brought up through the levels herself. Since then, she has trained many horses to the top levels. She has successfully represented the United States in International competition, including the 1988 Olympic Games and the 1997 European Championships. For more information on Phyllis' early riding experiences, follow this link to "Starting Out". Phyllis made her International debut at Boekelo CCI*** in the Netherlands in 1985, where she participated on the winning American team in the "friendly team competition" on Mountain High. In the autumn of 1987, she placed 2nd at the Chesterland CCI*** on Albany II. She followed this up with a 6th place in the Olympic Selection Trials in 1988 in Lexington, KY, which earned her a spot on the Olympic Three-day team in Seoul, Korea. Phyllis represented the United States at the Olympic Games in Seoul aboard Albany II and finished 10th, the highest placed American in the Olympic Three-day Event. It was really the experience of a lifetime. Phyllis was thrilled to put in a' personal best' performance, jumping clear around an extremely long and demanding cross-country test to finish tenth in the world on the day. The experience of competing among the top riders in the world and finishing well was exhilarating, as was the experience of living in the Olympic Village and mingling with famous athletes from all sports and countries. Phyllis and Albany II at the water jump in Seoul, Korea, 1988. Phyllis continued to compete successfully at the International level. She has ridden around the Rolex Kentucky Three Day Event over twenty times, and has several times completed the prestigious Burghley CCI**** in England. She has won Three Day Events at Radnor, PA, Essex, NJ, North Georgia, Checkmate, Ontario, and Bromont, Quebec. She has won the Advanced division at Morven Park Horse Trials a total of six times, and her wins and high placings on various horses at other competitions, both here and abroad, are too numerous to recount. Other highlights include being named the United States Combined Training Association's high point Leading Lady Rider in 1992, and the winner of the North American section of the FEI Landrover World Rider Rankings in 1997. Visit the Competition Horses page to learn about some of the special horses Phyllis has competed over the years. 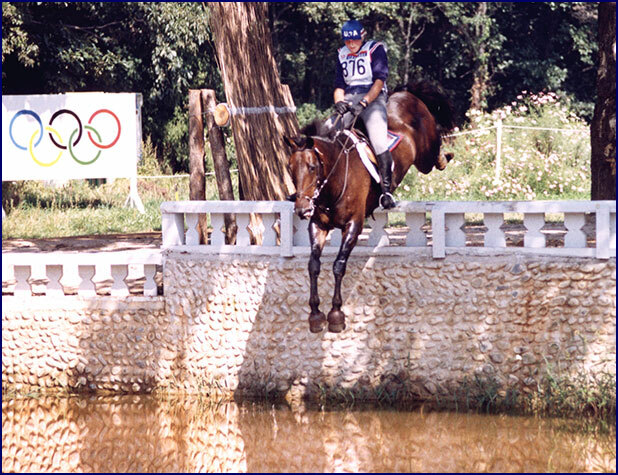 Phyllis had the opportunity to compete in England with the USET during the summers of 1997 and 1998. 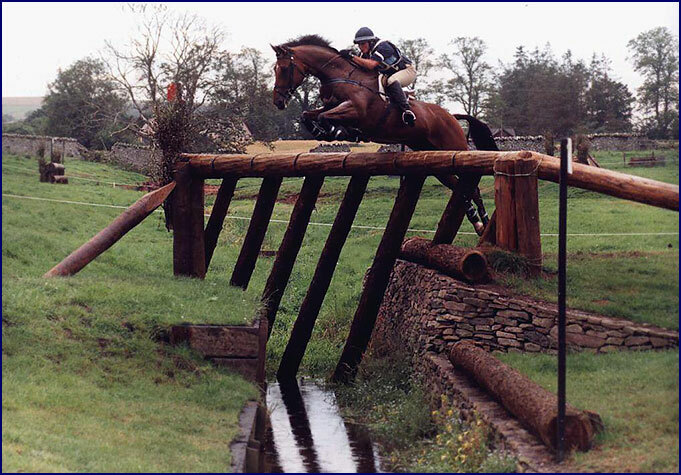 She competed successfully in many Events there, including the CCI*** at Blenheim, the Scottish Open Championships at Thirlestane Castle, the British Open Championships at Gatcombe Park, and the Bramham CCI***. 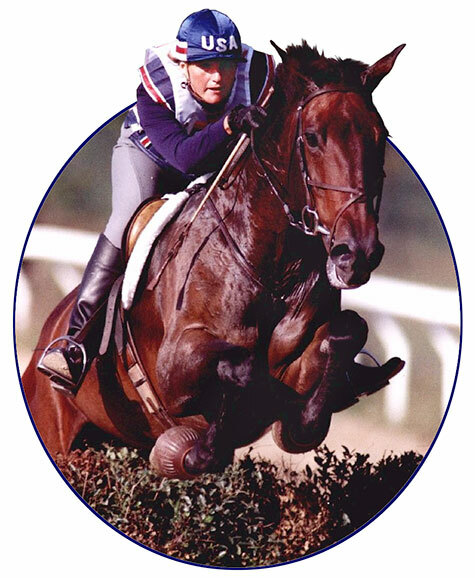 In 1997, Phyllis had the opportunity to again represent the United States Equestrian Team, when she rode in the Open European Championships at Burghley. A clear fast cross country round helped her finish a strong 19th out of a field of over 90 starters consisting of the best horses and riders in the world. Phyllis rode and trained many horses to a high level of success in Eventing. She has always enjoyed building a relationship with her horses based on mutual trust, and considers the rapport between horse and rider, built with a correct foundation of training, to be one of the most rewarding aspects of riding. Although no longer competing at the Advanced level, Phyllis is continuing this philosophy while concentrating on training and producing top quality young horses, and giving them the right start to their competitive careers. At Windchase, her Virginia farm, Phyllis specializes in offering an outstanding selection of talented prospects and Event Horses for sale, correctly started and well produced. Windchase also takes horses of all levels in for schooling and training, ranging from green-broke youngsters to high level Event horses being prepared for competition. We also offer top class instruction on there own horses for riders of all levels. For more information on these services, see our Boarding and Training page. We invite you to base your horse at Windchase and let us help you prepare for competition. There are excellent events within about an hours drive most weekends from the end of March through mid November. Windchase has everything you need in order to have you and your horse ready to do your best at the events. We offer everything from occasional schooling on request to complete preparation for the competitions, where you show up for the event and we have your horse ready to go. Come and join the Windchase Team. This is my personal motto, and I have had the good fortune to have the opportunity to ride and compete many excellent horses during my career. I have always enjoyed the process of really getting to know the horses that I was riding and competing, of having a chance to develop a partnership with them, a mutual trust. I have been Eventing for over thirty years now; my riding career has been a journey, and I have had many wonderful equine partners along the way. Here are some of the ones that have been the most special to me. With the exception of Albany, who is listed first in the place of honor, they are roughly in chronological order. Albany II will always be first and foremost in my heart. He took me to the Olympics, what more can you ask? I found Albany, a 1979 bay 17 hand English Thoroughbred cross gelding, in England. Riding Albany, I placed 10th individually in the 1988 Olympic Games in Seoul, Korea. That was one of the highlights of my life. Albany always tried his best to be good and do what was right, never once can I remember him misbehaving in any way. He always gave it 100 percent in everything he did. Albany passed away in the spring of 2006. He was a dear and gentle soul. He spent his last years wandering loose about the farm, going wherever he pleased, not constrained by fences. Everyone here at Windchase misses him! He shared my dreams and helped make them a reality. He took me where I had always longed to go. He helped me touch the sky. Starting with my first Advanced Horse and working roughly chronologically, here are some of the other excellent horses I have had the opportunity to ride and compete over the years. Freedom Flight was the first horse I rode at the Advanced level. What he may have lacked in talent he made up for in heart, and together, we competed at the upper levels for over seven years. He was really my 'Schoolmaster' horse, even though we learned together. He was forgiving of my mistakes, and we formed a strong partnership. The mileage I gained on Freedom was vital to my later competitive success. I owe him more than I can ever say. Mountain High was an incredibly big and strong horse that always wanted to go very fast. He would jump anything, and had the most magnificent extended trot you can imagine, but was quite difficult to control. I fell in love with him at first sight, and we developed a special relationship as I trained him and moved him up through the levels. I got my first taste of overseas International competition on Mountain High, when we were a part of the winning American Team at the Friendly Team Competition at the Boekelo CCI*** in Holland in 1985. Fleet Thing was the first of the race horses I bought from John McKee of Charles Town, WV. Since then, I have developed a great business relation with John, and have bought over three hundred Thoroughbreds from him over the years. Fleet was owned by my friend Hossein Askari, and he enjoyed a successful career up through he CCI*** level. Byeway was one of the only horses that I ever rode that was already experienced before I got him. He had been ridden by the great David Foster of Ireland, and was bought for me to ride by Hossein Askari. Byeway was one of the most talented horses I ever rode. He was very bold and strong cross-country, but if I could control him, he would jump anything! I completed my first Burghley CCI**** in England in 1991 on him. Desolate Angel was yet another horse owned by Hossein. He was only 15.1 hands, but all jump and power. 'D.A.' had no love for the Dressage phase, but he could really run and jump, placing at the CCI*** level. Indiana was an appendix Quarter Horse that I bought from Bruce Davidson. He was brought from the mid-west by the great horseman Mr. Tindel, who selected horses for Bruce. Indiana was always totally serious and focused about his work, and had a huge determination to succeed. I rode him to the Advanced level, after which he was purchased by Joerg Eichmann of Brandenburg Farm, who gained much competitive mileage riding this talented horse. Jet was another of the Thoroughbreds that I bought as a youngster off of the racetrack from my friend John McKee. He was always just a fun and cool horse to ride. Jet black and 17 hands, he was a real eye catcher, one of the most truly beautiful horses you will ever see. I rode Jet to the Advanced level, competing with him in England in 1994. After that, soundness issues dictated that he compete at a lower level, so he also went to Brandenburg Farm, where my friend Joerg had a successful competition record with him. Altair was a horse that I purchased in England. Very quiet and dignified, Altair was always a gentleman. He was quiet and laid back, but very talented. He competed successfully at the CCI*** level, including a clear round at Rolex in Lexington, and numerous Advanced level wins. Starbound was a horse I bought in Ireland as a youngster. He was extremely talented, but a also quite spooky and quirky, which made him a bit difficult to ride. He enjoyed success at the CCI*** level, including completing the Blenheim CCI*** in England in 1997. No Tomorrow was a homebred, so I knew him from the day he was born. Very talented, 'Tommy' has all the ingredients to go to the top. His only fear is cows, he has always been deadly afraid of them! Tommy went on to compete successfully at the Intermediate level with a Young Rider. Sirius has as much sheer talent as any horse that I have ever ridden. I purchased her in Ireland when she was a youngster from Robin Blackmore, she is a full sister to my four-star horse Star Bright. Sirius is now passing on her talent to her offspring as a broodmare. Half Magic was a 1985 16.3 hand chestnut Thoroughbred gelding by Ground Breaker. I bought him as an unbroken 2-year-old from racehorse trainer John McKee at Charlestown, WV, and he has been one of the horses dearest to me ever since. We formed a strong partnership from the start, and I have probably had more wins with Magic than any other horse I have ridden, including winning Three Day Events at North Georgia, Essex, NJ, and Checkmate, Canada. He has been short-listed for the U.S. Team on three different occasions, and has won or placed at the Advanced level numerous times. A truly beautiful horse, who always gave his best effort. Magic's career highlights include winning the CCN* at North Georgia in '92, the CCI** at Essex in '93, and the CCI*** at Checkmate, Canada in '94. He has won Advanced divisions at Morven Park in '94 and '97, and was 9th in the CCI*** at Rolex Kentucky and 6th in the CCI*** at Fair Hill in '97. He was short-listed for the World Equestrian Games in 1994, the Pan American Games in 1995 and the Open European Championships in 1997. Magic was a very beautiful horse who loved to be admired and to pose for pictures. He was quiet and gentle most of the time, but became highly enthusiastic when it is time for Cross-country. Sadly, Half Magic passed away in January of 2008. He was a great soul, and we will miss him very much. Snowy River was a 1986 gray Thoroughbred gelding by Babamist. He was bred by Bruce Davidson, and purchased by Phyllis as a preliminary horse in 1994. She brought him up to the Advanced level in '95, and they formed a very special partnership. He thought Dressage was a waste of time, but he could run and jump with the best of them. Some of his top placings include winning the Intermediate at Fair Hill Horse Trials in '95, winning the Advanced at Morven Park and placing 6th at the Fair Hill CCI*** in '96. 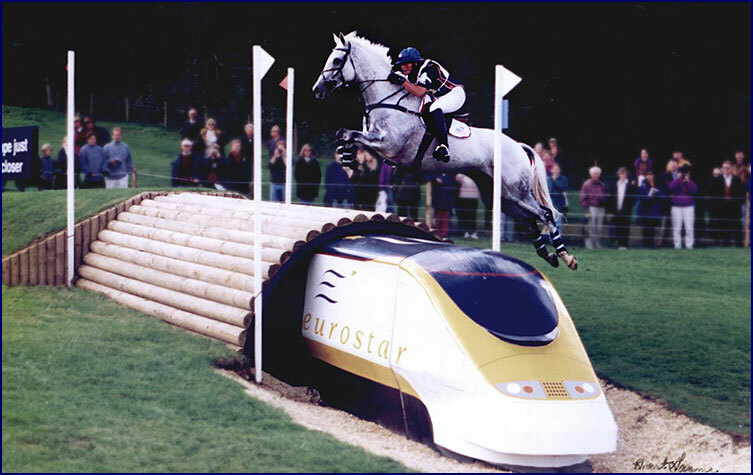 The highlight of Snowy's career came in 1997, when he represented the United States Equestrian Team in the Open European Championships at Burghley, England. He was also the alternate horse for the USET World Championship team in 1998. Sadly, Snowy passed away in early 2005. He was a great heart and a good friend, and we miss him. That challenges the wind for speed. Whose soul, in his tack, turns labour into Sport. He makes your pastime his. I sit him now! He takes away my breath. He makes me real. I see not - hear not - all is an ecstasy of motion! Brandenburg's Windstar was a 1994 Irish Sport Horse 16.1 hand gray stallion, owned by Phyllis Dawson and Jineen Reed. Phyllis competed Windstar at the Training level in 1999, with a perfect record, winning every event they competed in. Windstar's offspring are having great success in competition. He sired top level Advanced Event horses such as Arthur, Phoenix Star, Polar Storm and Polaris. We are thrilled with the excellent quality of his offspring. Follow these links to see photos of some of Windstar's Babies, or pictures of Windstar's Offspring in action. Some exceptional youngsters sired by Windstar may also be found on the Horses for Sale page. Star Bright is a 1990, 17 hand, bay Irish Sport Horse gelding by I'm A Star. I imported him from Ireland as a green-broke three-year-old, and he has rose to the top ranks very quickly. He won the CCN* in Bromont, Canada in'96, and in '97 was 1st in the Intermediate at Morven Park, 4th in the CCI**at Essex, and moved up to Advanced in the summer while competing in England. Upon returning home in the autumn, he was 8th in the CCI*** at Fair Hill out of a very competitive field of 80 horses, quite an accomplishment for a seven-year-old! In the spring of '98, he completed the four-star CCI at Rolex Kentucky, and was Short Listed for the World Equestrian Games in Rome. 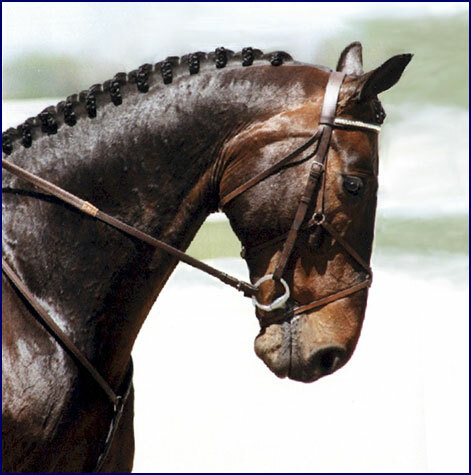 In 1999 Bright also completed the CCI four-star at Rolex, Kentucky. He placed 10th in the CCI*** at Foxhall, Georgia in May 2000. Bright is a very kind and gentle horse who always does his very best to please. He excelled in the dressage, and was a bold and scopey jumper. Sometimes playful and spooky, he would never really misbehave. He has a truly sweet personality, and always gives you his 100 percent best. Star Bright passed away in 2016. He has a place always in our hearts. Enniskerry Imp is a 1995 Irish Sport Horse by Master Imp. I bought him from Peter Green as a youngster, and brought him up through the levels to Advanced. He always had a very strong sense of humor and a great sense of fun. Excelling in all three phases, he was a blast to ride, and was one of my all time favorite horses. He is now happily competing with an amateur rider in Texas. Viatar is a 1998 black 16.2 hand gelding from Bulgaria. I imported him in the late autumn of 2003. He began his Eventing career in Bulgaria, and he quickly moved up the levels in America. He is a super jumper and an awesome cross-country horse, and has the potential to go to the highest levels. Viatar means 'The Wind' in Bulgarian. And though he feels like he can run and jump like the wind, he has a very gentle and sweet personality. He is very spoiled, and expects to be fed candy or mints constantly. He loves life in America, as it includes things like daily turnout and water buckets in the stalls; luxuries he did not get in Bulgaria! He likes to hack, trail ride and jump, and is willing to put up with the necessity of doing dressage in order to get to do those more fun things in life. In 2007 Viatar was ready to move up to Advanced level, but at that time I was retiring from upper level competition, so regretfully I sold him to an active competitor who hopefully will be able to give him his chance at the big time. Drifter is a 2003 Irish Sport Horse bay gelding, 16.2 hands. He is by the leading Eventing sire Master Imp, and his dam is a sister to my four-star horse Star Bright. I imported him from Ireland in 2006; with breeding like that how could I resist! He is very self confident and precocious, and a really phenomenal jumper. I enjoyed competing him up through the Preliminary level, and he is now bringing a Young Rider up through the ranks.